This PhD-project will explore how focusing on climate change can facilitate students’ critical mathematics perspectives. Conflicts, uncertainties, crisis and risk are important in the philosophy of Critical Mathematics Education (CME). CME can be characterized by addressing social justice, open new possibilities for students and addressing mathematics critically. Many people in today’s society celebrate and trust the rationality of mathematics, however, it is important to question mathematical rationality with a social responsible education. Climate change is a complex issue with a high degree of uncertainty, and involves mathematics to describe, predict, and communicate. 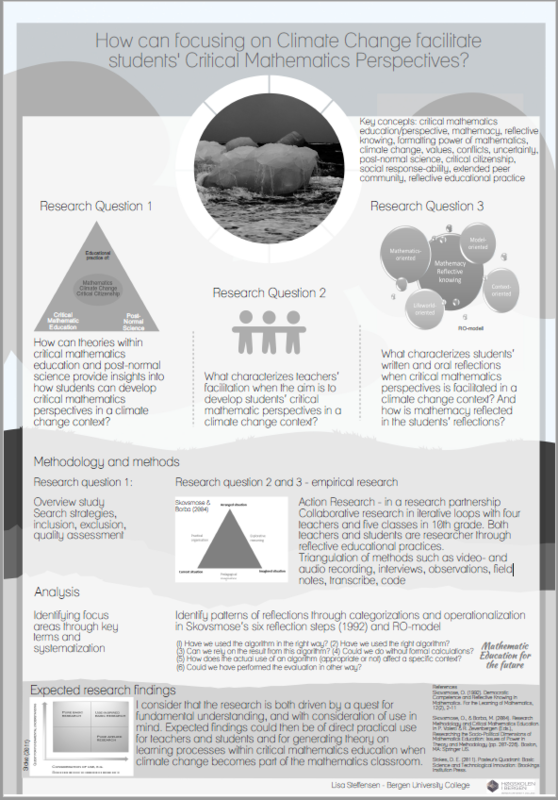 My first research question is “How can theories within critical mathematics education and post-normal science provide insights into how students can develop critical mathematics perspectives in a climate change context?” This will be answered through an overview study. The theoretical framework will be relevant for my further research. The second research question is “What characterizes teachers’ facilitation when the aim is to develop students’ critical mathematic perspectives in a climate change context?” This question will be explored by collaborate research partnership with teachers from lower secondary school. The aim of the partnership is reflective educational practice in iterative loops. This question has a perspective towards teachers. The third research question is “What characterizes students’ written and oral reflections when critical mathematics perspectives is facilitated in a climate change context? And how is mathemacy reflected in the students’ reflections?” This latter question has a perspective towards students. Matemacy can be defined as “a capacity of making responses and as reading the world as being open to change”.